The Sandia Peak Tramway, located adjacent to Albuquerque, New Mexico, USA, is the world's longest passenger aerial tramway. It also has the world's third longest single span. It stretches from the Northeast edge of the city to the crestline of the Sandia Mountains. The New Mexico Museum of Natural History and Science is a natural history and science museum in Albuquerque, New Mexico near Old Town Albuquerque. The Museum was founded in 1986. The Museum's permanent exhibit halls illustrate a "journey through time", covering the birth of the Universe (≈13.6 billion years ago) to the Ice Age (≈10,000 years ago). 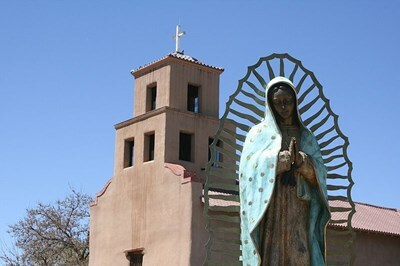 San Miguel Mission, also known as San Miguel Chapel, is a Spanish colonial mission church in Santa Fe, New Mexico. It is claimed to be the oldest church in the United States. Built between approximately 1610 and 1626. The church was damaged during the Pueblo Revolt of 1680 but was rebuilt in 1710 following the Spanish reconquest and served for a time as a chapel for the Spanish soldiers.